Almond Coconut Granola Bar Recipe! No time for breakfast? Granola bars to the rescue. Hungry on the plane? Granola bars sure beat pretzels. Long stretch between lunch and dinner? Again, granola bars. They keep your blood sugar levels stable, and keep you from turning into a cranky, hypoglycemic mess. Granola bars are the answer! These bars require about 15 minutes of prep time, then an hour-long rest in the refrigerator to set. Recipe yields 16 granola bars. Line a 9-inch square baker with two strips of criss-crossed parchment paper, cut to fit neatly against the base and up the sides. The parchment paper will make it easy for you to slice the bars later. Toast the almonds for maximum flavor. In a medium skillet over medium heat, toast the almonds, stirring frequently, until they are fragrant and starting to turn lightly golden on the edges, about 5 minutes. To the mixing bowl, add the oats, toasted almonds, coconut flakes, cinnamon and salt. Stir until blended. In a 2-cup liquid measuring cup, measure out 1 cup almond butter. Top with ½ cup honey, followed by the vanilla extract. Whisk until well blended. Pour the liquid ingredients into the dry ingredients. 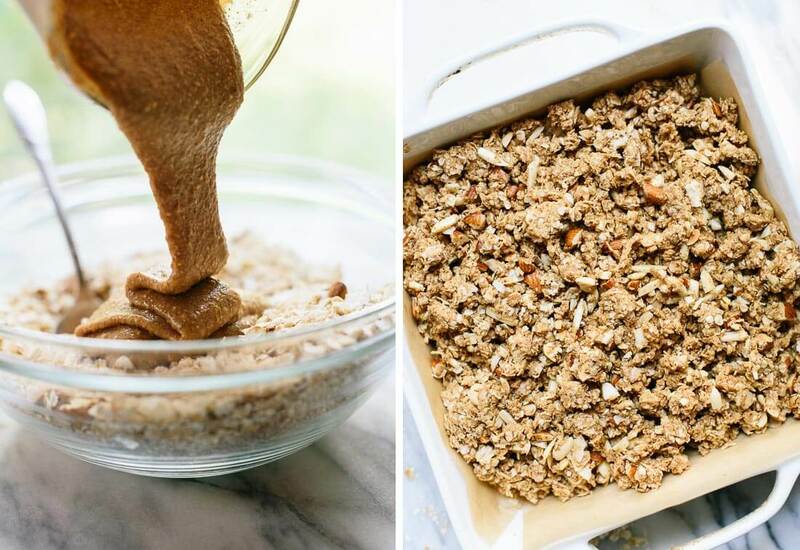 Use a big spoon to mix them together until the two are evenly combined and no dry oats remain. The drier the mixture, the more firm the bars will be, so stir in extra oats if the mixture seems wet. Transfer the mixture to the prepared square baker. Use your spoon to arrange the mixture fairly evenly in the baker, then use the bottom of a flat, round surface (like a short, sturdy drinking glass) to pack the mixture down as firmly and evenly as possible. Cover the baker and refrigerate for at least one hour, or overnight. This gives the oats time to absorb moisture so the granola bars can set. When you’re ready to slice, lift the bars out of the baker by grabbing both pieces of parchment paper on opposite corners. Use a sharp knife to slice the mixture. You can wrap your bars in plastic wrap or parchment paper and keep them several months in the freezer.